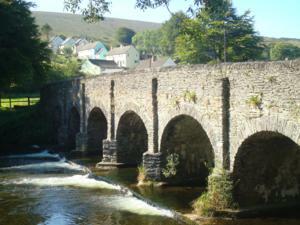 Ivybridge is the walker’s entrance to the mighty Dartmoor National Park and the Two Moors Way. 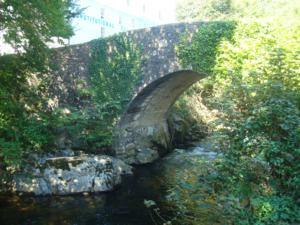 Although the nearby manor of Stowford is documented in the Domesday Book, first mention of Ivybridge was in the 13th century when the small granite packhorse “Ivy Bridge” was the only means of crossing the River Erme. Still in use today it was immortalised in paint by non other than Turner in 1813. You can still see the iron stave in the bridge wall which was lit at night to illuminate this vital crossing. Ivybridge subsequently became an important staging post for carriages between Exeter and Plymouth for the next five hundred years until 1819 when other routes across the river became possible. This coincided with the Industrial Revolution, a growth of wool, corn and paper mills which with the arrival of the railway brought jobs and expansion into the small town it is today. 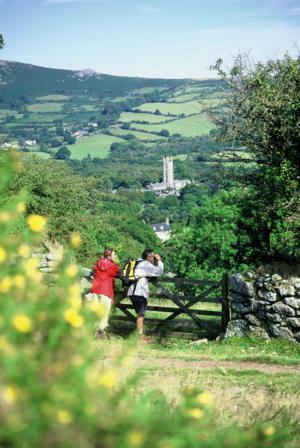 Ivybridge’s position on the southern edge of Dartmoor National Park marks the beginning and connection for a number of walking trails, most importantly the start of the Two Moors Way and the link with the Erme Plym Valley Trail to Wembury and the South West Coast Path in South Devon. With rail connections to Plymouth, Bristol and the mainline to London it is a well located starting point for walkers heading onto the moor with a scattering of B&B’s in the town and one or two more upmarket country house hotels in the nearby villages. The main shopping area of Fore Street has a number of independent businesses and evening meals can be found at any one of the six pubs or alternatively at a choice of restaurants from Indian and Greek to fish and chips. Arriving at Holne from the south eastern slopes of the Dartmoor on the Two Moors Way or Dartmoor Way, you are presented with a delightful small village which is home to about 250 people, bounded on two sides by river valleys, the Holy Brook and the stunning infant River Dart. Its long been a place of settlement with a well preserved Iron Age fort at Holne Chase and finds of Greek silver coins and iron “currency” bars at Court Farm dating back to the 1st Century BC. Its medieval history is also evident within both the church of St Marys and the village pub dating from the 12th century when the Church House Inn was built by the stonemasons working on the church to provide their board and lodging. The Church House Inn is the only place to eat here, but as it prides itself on serving local produce to eat and drink and welcomes walkers, you can be assured of being made welcome and comfortable. Close by and another choice for an overnight stay is the village of Scorriton, again just a few houses nestling in the moor but boasting an excellent pub with rooms - The Tradesman’s Arms. 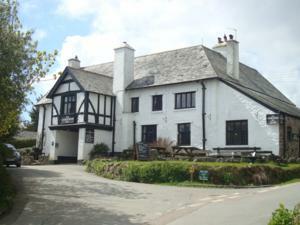 A traditional "country pub" with modern styling and a very friendly welcome, listed for its quality real ales by CAMRA as well as provider to the hungry walker of good home cooked food this is a good overnight spot. The pub itself is a community success story, now owned by four drinking pals who were so upset when their local pub closed that they decided to get together and buy it raising £230,000 to reopen it. One a Council Officer and another a Train Driver all four gave up their jobs to save for and work in their local watering hole! Finally if you see anything strange whilst taking the air after an evening in the Tradesman’s you are in good company. In 1965 one of the West Countries most famous UFO sightings took place on the down just above the village. Local man, Arthur Bryant not only saw a large saucer shaped craft but indeed claims to have met three aliens and had a conversation with them outside the village. Before you dismiss it all too quickly the next day pieces of metal, machinery and a glass cylinder full of silver sand were recovered from the location. "The Scorriton mystery" is fully documented in the book by Eileen Buckle and has now become a very different type of Dartmoor folklore. Widecombe, in the heart of the Dartmoor National Park will probably be one place name you recognise - few people will not recall the famous song about Tom Pearse going to Widecombe Fair. The fair itself is rightly very famous, the first one was held in 1850 when it was decided that the village had a large enough green next to the churchyard to hold a Free Fair where “yeomen and gentlemen of the district” could bring their cattle and sheep. The first one recorded that 50 moorland ponies were also driven in as the Widecombe stock was highly prized. 'Withy-combe' which means Willow Valley is still respite from the harsh moorland terrain today and the village has probably not changed much over the years, though these days its the one location on the Two Moors Way that sees a reasonable share of tourists due to its pretty surroundings. Still dominated by its church of St Pancras this is better known as the Cathedral in the Moor because of its size and huge tower. The saint himself is said to have been a Roman convert to Christianity, martyred by beheading at the age of 14. Inside the church look for the huge granite pillars and its unique set of carved roof bosses whilst those on the trail of Sherlock Holmes's Hound of the Baskerville’s will find Henry Baskerville's grave outside – inevitably there is also a memorial here to Uncle Tom Cobley. The Church itself was struck by lightning in the middle of a packed service in 1638 and you find several references to what then quickly became national news. One local recalled that ‘a great fiery ball come in at the window and passe through the Church, accompanied by fire, smoke and a strong smell of brimstone'. Four worshippers died and 60 were injured before local legend took hold claiming the Great Thunderstorm was caused by the village being visited by the Devil himself. Widecombe's traditional triangular village green is a pleasant place to sit and rest weary legs on the seats nailed to the trees whilst taking in the views of the Church and the dominating moors above. 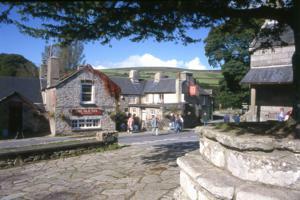 There is a range of small shops, a pottery and old forge as well as several eating places around the green. Today, tourism is the main industry with the National Trust managing The Widecombe Church House built in 1537 for the production of church ales now housing a National Trust gift shop. For the walker coming in from the heath there are tea rooms and 2 pubs, The Old Inn where the original beams are 700 years old and The Rugglestone Inn, a delightful inn converted from a cottage, both offering locally sourced food and drink. Accommodation in Widecombe is all in nearby B&B’s or farms and for anyone finding the Two Moors Way a bit tough by this point Widecombe is the centre for Dartmoor’s famous Trekking Llamas which we are told can be hired for carrying packs by walkers! The largest settlement of any size you will come across on The Two Moors Way and a welcome overnight stop for those circling Dartmoor on The Dartmoor Way. 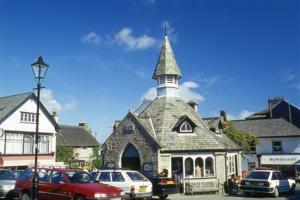 Chagford is a thriving community in a fascinating small town with an impressive number of hotels and shops - arguably the prettiest and most interesting small town on Dartmoor. The name originates from “Chag” meaning where the gorse grows, the yellow moorland shrub and the “ford” refers to its importance as a crossing place over the pretty River Teign. Although there is evidence of its existence for 4000 years, Chagford grew in size and stature through its wool industry and tin mining, becoming one of four Stannary towns in the early 14th century receiving tin from all over Devon to be weighed and stamped here. A long time beacon for those searching for habitation from the high moor, Chagford’s more bizarre claim is to have been the first town west of London to be lit by electricity due to an early experiment with hydropower as far back as 1891. 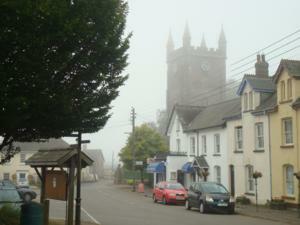 Chagford for the walker has a very pleasant moorland air to it with many intriguing little lanes to explore leading off the impressive village square down rows of coloured; cob walled and thatched cottages and larger granite buildings. The appealing eight sided “Pepper Pot” Market House is still a focal point in the village and the site of the Old Stannary Court and the town’s regular moorland cattle market only ceased here around 20 years ago. The church of St Michael is well worth a look, its most famous item a memorial to one Mary Whiddon, dated 11 October 1641 who was shot dead by a jealous suitor as she left the church porch on her wedding day. Although he took the inspiration to Exmoor this was the basis for part of the Lorna Doone novel by R D Blackmore, even today tradition is that brides lay a flower on her tomb after signing the register. Facilities are excellent and it’s a good place to browse and stock up before hitting remote mid Devon. Here you will find banks, a variety of antique, clothes and gift shops as well as art and craft galleries a post office, chemist and most famous of all the twin institutions of Webbers and Bowdens. Known here as “the shops that have everything” these are family hardware providers that date back to before the last tin mine shut in 1903, indeed Bowdens even has a small museum within the store covering Chagford life over centuries. There is a notable community of local artists and the town has its own Arts Festival. There is even a public open air swimming pool, the largest in mid Devon, its river fed and a treat if you are lucky enough to arrive here from the moors on a sun soaked summers afternoon. There is plenty of accommodation B&B and Inns as well as good eating places ranging from nearby Gidleigh Park with its 2 Michelin starred restaurant, an AA 2 Rosette award option at 22 Mill Street as well as the four pubs in the town and a handful of cafes. The Three Crowns Hotel is a 13th Century option still haunted by the ghost of a cavalier killed here by the Roundheads in the English Civil War. The other pub full of history to try is the Ring of Bells, here the upper part of the pub was a holding prison for those being marched over the moor to the Okehampton Assizes, the first floor was the village mortuary.... and Coroners Court.... still if you have walked over the moor we are sure you will sleep well if you stay here, despite all this! 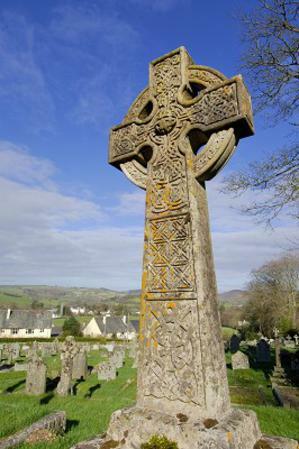 Drewsteignton is yet another charming moorland town with its 15C church, thatched cottages and pub set around a picturesque village square which also has several works from the renowned Sculptor Peter Randall-Page that the inquisitive walker can locate. 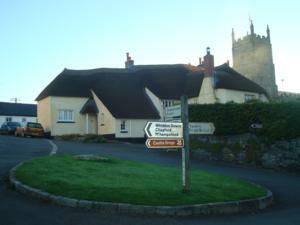 A protected conservation area of cob cottages, the Thatched Drewe Arms pub sit next to the pretty Trinity churchyard in the centre of the village. At the Drewe Arms real ales straight from the cask are served in the tap room. Until fairly recently the pub boasted the oldest landlady in the country Mabel Mudge who retired from behind the bar at a very impressive 99 years of age. For those staying over, nearby evening wanders include a Neolithic burial chamber at Spinsters Rock or an amble down to the Iron Age Hill fort at Prestonbury Castle before a nightcap at Fingle Bridge at the nearby Teign Gorge. 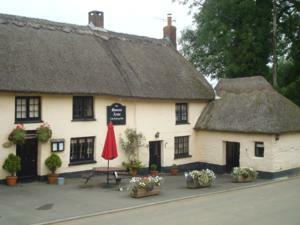 Along with the Drewe Arms for eating there is also the Old Inn, highly recommended for its food in the Michelin guide. Castle Drogo a stunning grade 1 listed building, sits just along the lane, now owned by the National Trust and well worth a visit. A remarkable granite structure set high above the gorge this was the last castle built in England when it was commissioned by the Tea Magnet Julius Drewe who made his fortune in trading tea from India. Having returned to England and finding this superb plot hanging 1000ft above the Teign gorge he set about his dream claiming that the land heralded from a Norman baron named Drogo de Teign a distant relative of his. 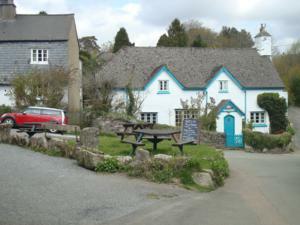 In the remoter village and pastoral lands of hidden mid Devon the twin villages of Coleford and Colebrooke provide well placed overnight stays having exited the Dartmoor National Park. 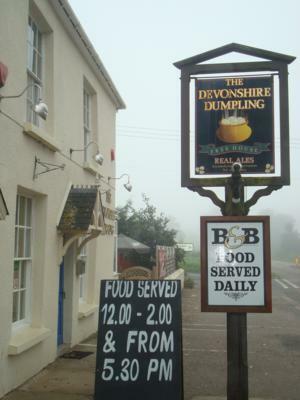 Just off the Two Moors Way route Coleford has an excellent AA4* rated inn. 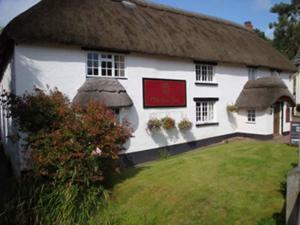 The splendid thatched New Inn has great food and real ale as well as 'Captain' the talkative Amazon blue parrot who has greeted guests from Exeter and beyond for over 27 years. With a varied restaurant offering daily seafood, luxury accommodation, fine wines and a superb collection of malt whiskeys this is just the place to celebrate the finishing of one moor and the calm before the next. Don't feel guility either, its traditionally a pilgrim’s overnight spot having provided for travelling Cistercian monks from Exeter since the 15th Century. The Inn is the mainstay of the village but for those on a budget there are also B&B options nearby. The 14th C church is worth a quick look whilst here with unusual carvings on the pew ends including some of the Wild Man and the Fool. With a sleepy rural village feel to it Morchard Bishop, meaning Great Wood (Mor Coed), is now a protected conservation area with many 14 and 15th C buildings and the longest row of thatched cottages in Devon to admire. On top of this for thirsty walkers it also provides the welcome London Inn. 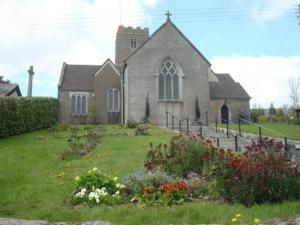 The Parish Church of St Mary is superbly sited, sitting at the highest point of the village and full of atmosphere with its Larva Pillars and Churchyard views stretching to both moors on the horizons. Whilst it can’t boast the UFO’s of Holne this place had its own galactic incident in 1952 when the impressive 95ft Church Tower was stuck and damaged by a meteorite. Nearby can be found a memorial to 13 men who died when two Halifax bombers collided and crashed in the Morchard area in 1944 towards the end of the Second World War. The village has certainly been through hard times. Once the main staging post for the Barnstaple to Exeter carriages, Morchard Bishop become isolated as a staging post as the main roadway moved a few miles west, the London Inn no longer benefiting from the passing coaches. Perhaps these difficult times influenced the village’s most famous son Ernest Bevin who was at school here in 1889. This was a time the area was struggling with a dwindling population forced to move to the newer towns away from what was becoming a difficult agricultural economy. Bevin left these stunning fields and green lanes behind and headed on to Bristol where of course he went on to help inspire and create our modern Welfare State. 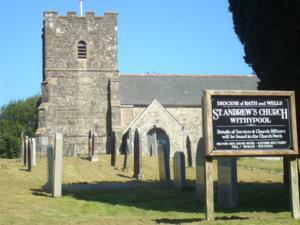 Witheridge like Morchard Bishop and Knowstone is another vibrant and proud mid Devon community, a conservation protected village openly welcoming walkers in from the Two Moors Way by calling itself the 'gateway to the path'. Witheridge meaning “Weather Ridge” was no doubt a name earnt from its exposed position on the top of the hillside. 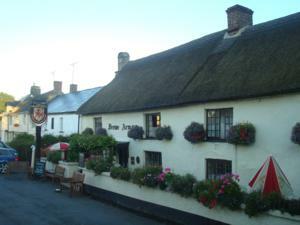 Its old square is still surrounded by Cob and Thatch dwellings and was the focal point in past times for the large village cattle markets that made Witheridge famous in Devon. 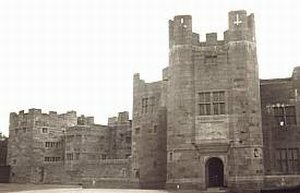 The St Johns Charter Fair which was an annual event ran from here from the 13th Century and is one of the oldest recorded fairs in the UK. The event has now been resurrected by the modern community in the 90’s having disappeared between the wars. These days it now hosts the Official Devon Town Criers Championship ! For walkers you are looked after by several B&B options along with the Mitre Inn a grade 2 listed 16th Century Coaching House as well as having The Angel Restaurant and the village farm shop. Knowstone another small staging post on the Two Moors Way with a population of around 200 centres around its very pretty thatched pub, The Masons Arms which was originally constructed by the builders of the nearby parish church and was made up of three cottages. It’s now renowned far and wide for its food and holds a Michelin Star as well as running regular chef’s Master Classes. St. Peters Church which was built in the 13th Century remains unspoilt and like all those in the mid Devon area is well worth a quick visit. Whilst the Masons Arms does not have its own lodgings there are a couple of local B&B’s that allow an overnight here with the chance to visit the Masons for some of the best dining on the whole 89 mile walk. A superb location with a stunning entrance from the Barle River and Tarr Steps to a village rightly called the capital of Exmoor. White washed stone cottages huddle around the central Royal Oak Inn a haven for walkers, hunters and pilgrims over the ages. Withypool itself whilst small is full of character, its impressive six arch bridge the all important river crossing of the Barle. 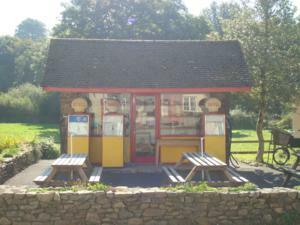 Here you will find a local store, tea room and the most amazing petrol station, worth the trek in alone. The “Olden World” filling station with its ancient shell petrol pumps are from a time long gone - think of the Walton’s and you are on the right lines. 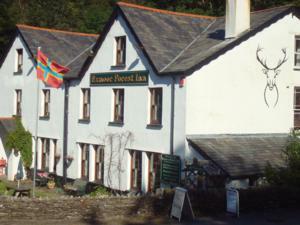 The Royal Oak is a sprawling Inn with bags of history its locals proud of their hunting past in Exmoor Forest and the walls are covered with an array of trophies and heads of a wide range of local wildlife. It’s a superb place to spend the night with roaring fires, dark corners, rambling passages and plenty of hunting tales. R D Blackmore wrote parts of the classic tale Lorna Doone whilst staying here in the 1860’s and during the Second World War General Eisenhower planned much of the D Day Landings here, basing himself in the Inn whilst the American Forces were training on the coast nearby at Woolacombe. He was granted an annual pension of twenty pounds by Richard II in 1394 for his duties and spent time here continuing work on his famous Canterbury Tales. For those wanting an evening leg stretch nearby Withypool Hill at 1300 ft is a good climb with superb views off the summit towards the coastline and with a bit of searching you can locate a Bronze Age Stone Circle on its southern flanks. The high level village of Simonsbath emerges from the mid moor and forest plantations and for the walker offers the promise of respite in its two hotels and welcome tea rooms. The writer Daniel Defoe was clearly in need of such help 300 years ago when he referred to the land around Simonsbath as a “filthy barren ground”, clearly nothing like his Robinson Crusoe’s paradise island but then there was little here at that time, as the village you see today was created in the 19th Century by the Knight Family. Simonsbath was the heart of The Royal Forest of Exmoor in medieval times and north of here rises the River Exe but the village itself sits on the infant River Barle and for those stopping overnight provides some fine short woodlands walks enhanced by wood carvings from Mike Leach the National Park Ranger here. 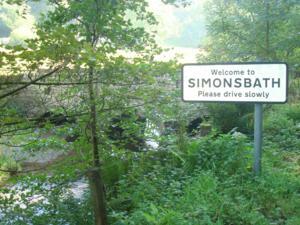 Simons bridge is still here (Simon said in legend to have been a great hunter and Robin Hood type figure who resided at Symonsburrow), the triple arched medieval bridge still standing over the rushing river. The Exmoor Forest Inn is the obvious choice for a break or an overnight stay proving good accommodation and food in this remotest of spots. 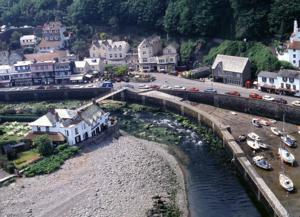 Beautiful Lynmouth is where the huge hog back cliffs and moors finally collide with the ocean - literally. The town was christened Little Switzerland by its first tourists back in the early19th century when the Napoleonic Wars closed the Continent and in particular the Alps to would be travellers. 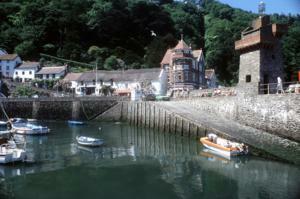 Lynmouth was the home option and it is indeed a breathtaking location. Loved by Wordsworth, Coleridge, Blackmore and Shelly, Thomas Gainsborough called it “The most delightful place for a landscape painter this country can boast” and the deep wooded gorges, bays and rocky outcrops he enthused about are still delighting visiting walkers. The place still has that Victorian feel to it with its promenades, harbour and the ingenious Cliff railway that links the towns. You have to take a ride on this piece of history whilst here. 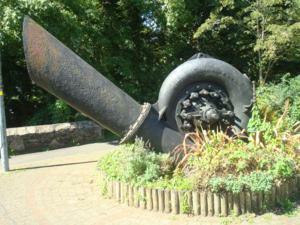 Opened in 1890, the railway is actually water-operated with water piped up from the West Lyn River. One car descends the almost sheer cliff face, while the other ascends, on a counterbalance system that has proved more reliable than most modern railways ! The total cost of the project was £8,000 and there has never been an accident. 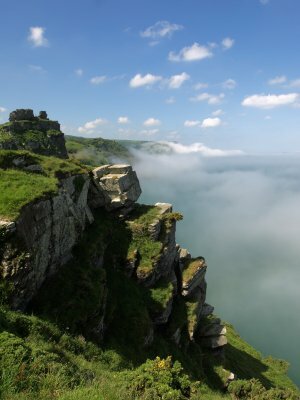 For those staying on a day or so OR walking on down the South West Coast Path in North Devon, just outside Lynmouth is the iconic Valley of the Rocks. Twisted and contorted rock formations, The Devils Cheesewring, Ragged Jack and The Castle to name only a few, puncture the coastal panorama and are home to a population of wild mountain goats the only surviving wild group outside of Scotland. A "rest day" can be spent with river walks past thundering waterfalls to Watersmeet through one of the Uk’s deepest gorges to the former Victorian fishing lodge, now a National Trust run tea shop. Or head to the harbour for a boat trips to see the stunning cliffs and hog back peaks from the water before heading on down the coastpath. For those wanting to find out more about the terrain they have trekked, The Exmoor National Park visitor centre is here along with the Lyn and Exmoor Museum housed in the towns oldest surviving cottage. At the Lynford Memorial hall you will find displays covering the devastating tragedy that befell the town one night in August 1952 when a torrent of water from the flooding gorge killed 34 locals, destroyed over 100 buildings and bridges and washed nearly 40 cars out to sea. Over 420 people were made homeless that night and much of the lower harbour area was rebuilt after this time. Facilities for visiting walkers are excellent with lots of varied accommodation, luxury hotels, inns, restaurants, tea shops and plenty of browsing opportunities in the art and craft shops that somehow retain their Victorian and Edwardian character.